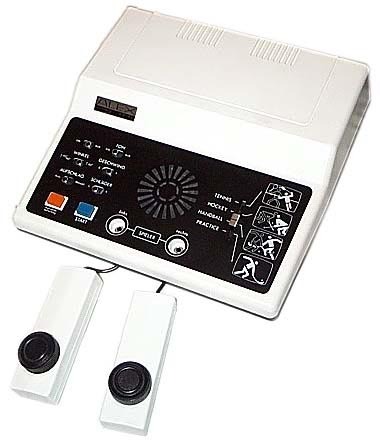 A classic german pong system which uses the GI AY-3-8500 chip, thus playing the 4 basic pong games. No shooting games here... Something rare for that time, the two tiny controllers are not hardwired to the system. This means that when one of them died, it wasn't necessary to change the whole system. It is also interesting to note that many different brands used this particular case. The Conic TV Sports TG-621 for example is the same system. see more Alex Video Spiel TG-621 Ebay auctions !